Congratulations to the 2015 Vegas Masters 8-Ball State Champions, Knuckleheads of the Rum Runner. Pictured here: John Stanelle, Larry Long, Jay Adelstone, Joe Cave and in front, Zeke De Rose and William Tuczynski. Not pictured: Jim Blakeman. 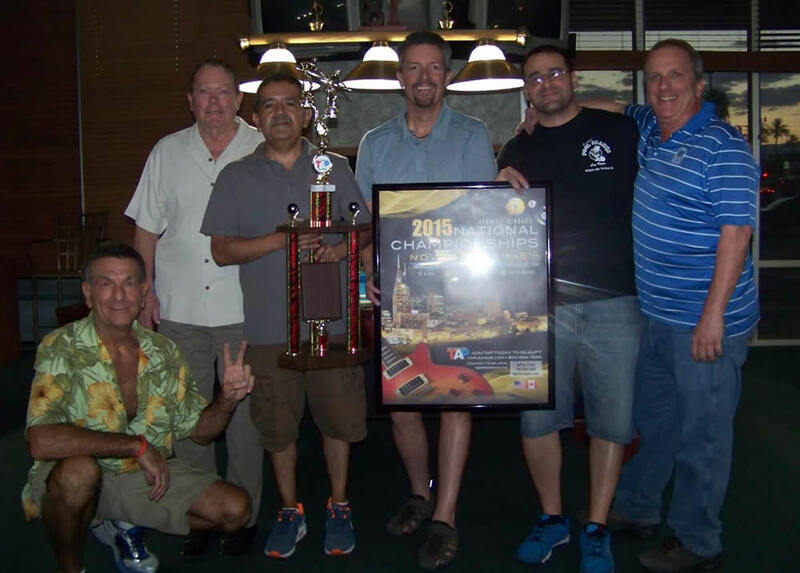 Congratulations also to Shark Shooters of Pool Sharks, Zeke De Rose, Bill "Elmer" Kurr, Alfredo Martinez, Bill Kurr, Mike Holland and Joe Cannella. Not pictured: Dean Howell and Gellian Holland. The team earned 2nd in a close hill/hill match against Knuckleheads. Congratulations to Chalk's Free of Mickey's Cues & Brews for earning 3rd place, Jenna and Andrew Wilhems, Connie Foschi, Brian Deluca, Bob Cauley, and Sophia Briski. Congratulations to Mickey's Finest for earning 4th place, which is no small feat. Mickey's Finest will be given the opportunity to compete should any of our top teams be unable to attend. These top 3 teams will be respresenting Nevada at TAP Nationals! They will play and stay at Opryland Resort in Nashville, winning a travel package and entry. They'll also be invited to the exclusive TAP Welcome Party! Congratulations to Ball in Hand's Dawn Holland, Ron Green, Norberto Davila, Jennifer Skippergosh and Terry Burgess and Pooliticians' Bill Kurr, Alfredo Martinez, Brian Deluca and Mike Holland (not pictured: Dean Howell) for making it to the top of the Best of the Rest Board. In the first match of the finals, Dawn Holland won her match against Alfredo Martinez, at which point the teams mutually decided to split the winnings with a prize fund of $1,200!! The Vegas Masters began with 30 teams competing in the round robin with the following teams making it to the top 16 Championship Board to compete in a single elimination tournament: Mickey's Finest, Menehune Shooters, Dean Howell, Shark Shooters, That's How We Roll, Knuckleheads, The Shooters, Magic Q's, Fear None, Chalk's Free, Lil' Stix Big Balz, Slice and Dice, 14 Balls and A Hole, 8-Ball Teasers, Shady 8's, Well Balanced and Faded 8's. The remaining teams continued on the Best of the Rest Board to compete in a single elimination tournament: Shark Bait, Team 8, High Rollers, CB's, DILLIGAF, Pooliticians, Split Decisions, Eliminators, Salt & Pepper, Loud Rollers, The Underdogs, Ball in Hand and Eight Ball Mafia. Congratulations to Chris Erickson for winning the 50/50 raffle and thanks to everyone who participated in the fundraiser raffle! $173 will be added to the player's National travel fund. We want to thank everyone for their participation in league and the Vegas Masters. Without our dedicated members, this would not be possible. We look forward to traveling to Nashville with all of these fine folks and to many more years of providing a great league to all of you! Thanks!! 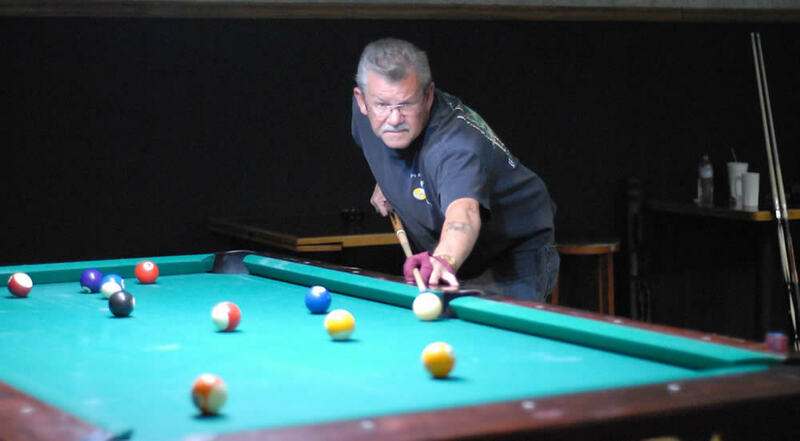 A special thanks to Shawn, Robin and the entire staff at Mickey's Cues & Brews for their hospitality and providing the opportunity to host our Vegas Masters in such a fine pool room. 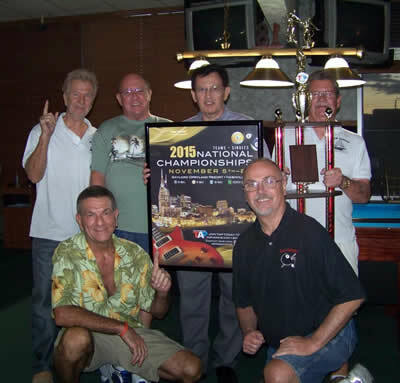 Congratulations to the 2015 Vegas Masters 9-Ball State Champions, Cheers 2 U. 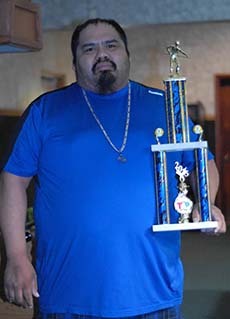 The team went undefeated at this annual tournament held on August 2, winning the State Championship for the second year. The team changed up just a bit with the addition of Nathan Merrell and William "Scott" Fisher. Leading the way to their victory were Jim Carmona, Scott Moden and Tina Moden who went undefeated in their individual matches! The team advances with a prize package of over $2,000 to compete at TAP Nationals. They will enjoy a 4 night stay and play at the Opryland Resort in Nashville and be invited to the exclusive TAP Welcome Party! 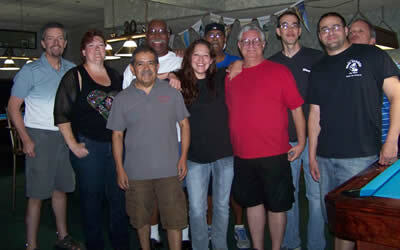 From left to right, Nathan Merrell, Tina Moden, Scott Moden, Donna Schwitters, William "Scott" Fisher and Jim Carmona. Click on the image to see it in full resolution. 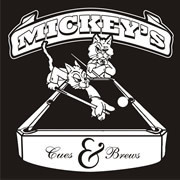 A special thanks to Mickey's Cues and Brews for once again providing us with an awesome venue and great hospitality! 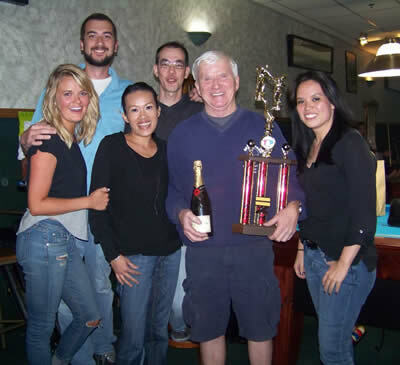 The 8-ball team tournament is said to be the largest established (born in 2007) locals-only team tournament in all of Las Vegas with a prize fund typically exceeding $10,000-$12,000. A full field of approximately 32 teams for 8-ball and 6 teams for 9-ball with close to 200 players compete every year!! 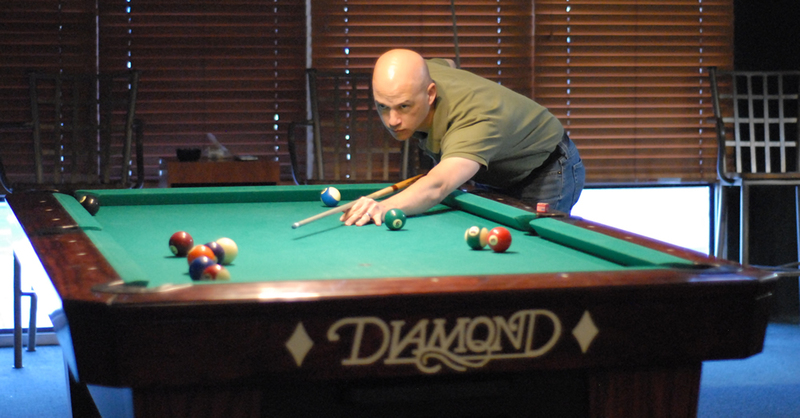 To qualify for 8-ball, teams place 1st, 2nd, 3rd or are drawn as the Wild Card in their division during the Summer, Fall or Spring Sessions. 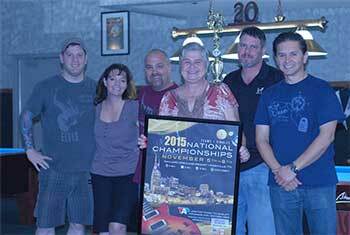 See the Vegas Masters Road to Nationals for complete details on qualifications, format and more. 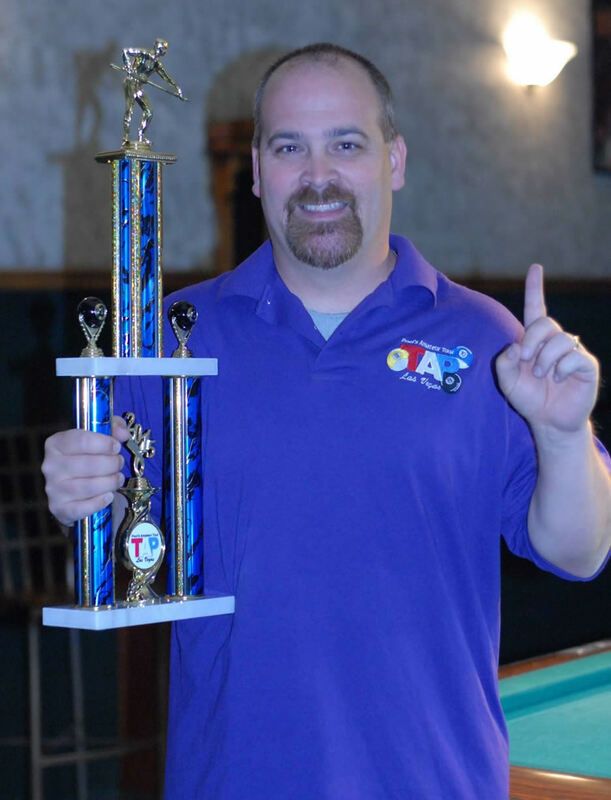 On average, 1 out of 18 teams in 8-ball and 9-ball will advance to compete at the TAP League National tournaments.The top team(s) win a travel package, team trophy, invitation to the exclusive TAP National Welcome Party and a paid entry into the national event. 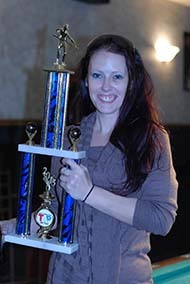 TAP Nationals is held in an exciting different city every year. TAP Las Vegas generally provides airfare, up to 3 hotel rooms for 4-5 nights (depending on the scheduled dates along with the start and end times) and the entry fee to TAP League Nationals for eligible members of the winning team(s) or players. This is a $4,500-$5,000 award. Partial packages are sometimes awarded based on team counts and the associated budget. Fundraiser tournaments and 50/50 raffles are held throughout the year to offset the cost of airfare for the teams receiving partial travel packages. 2015 Vegas Masters MVP Singles State Championship! 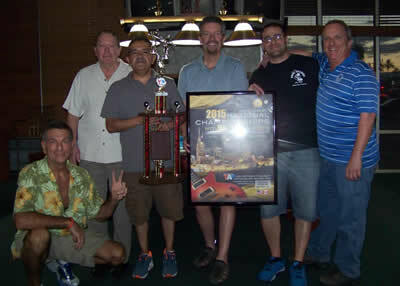 The 2015 Vegas Masters MVP Singles State Championship tournaments were held on April 11 & 12 at Mickey's Cues & Brews where 76 players competed and $4,500 was awarded in cash and prizes! A two day grand event played on all Diamond tables!! Congratulations also to Joe Cave for winning the 2nd place raffle, which includes a trip to Nashville to compete in TAP Nationals! Joe climbed his way up from the one loss side, won the first match and went hill/hill against Jenna Virden for the Championship. Michael, Scott and Darrell each won their brackets undefeated! Dawn Holland-Williams won the $113 in the 50/50 raffle! The other 50% going to the National Singles Fund to help with travel expenses. Stay tuned, as we may be drawing one more 2nd place raffle ticket soon! A very special thanks to Christina Jeff, Scott Moden and Michael Hutcheson for stepping in to referee. Christina gets the award for best dressed referee. Thanks also to Shawn, Robin and the Mickey's staff for their hospitality and awesome room.